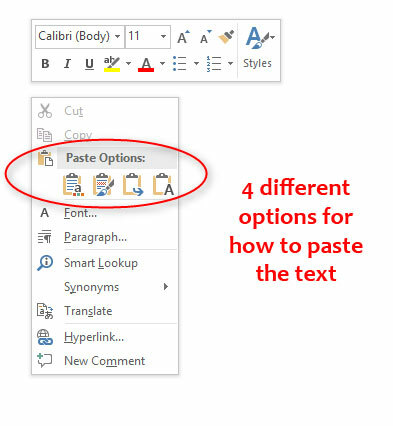 What does the Paste Options box do in MS Word? I use the Copy – Paste process every day, and you probably do as well. For the most part, it’s pretty straightforward – you choose a word or section of text and copy it from one location, then you go to another location and paste it. 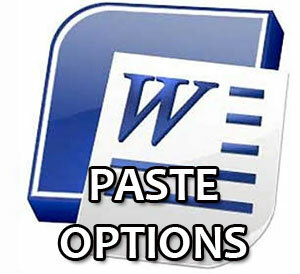 But when you’re pasting into a Word document, there’s another thing that comes up – the “Paste Options” box. What is that thing? You’ve probably seen this thing, even if you don’t know it by that specific name. How do you know which one you want? So now you know what your 4 options are – but what do those titles mean? Use Destination Theme: This means that the text you are copying will take on the theme that is already being used in the Word document. Keep Source Formatting: This means that whatever formatting was in the original (in this case, the email), that formatting will be brought over with the text that is being copied. Merge Formatting: This means that the text being copied will not necessarily take on the look of the entire Word theme, but that it will take on the formatting style of the text that surrounds it (if any). Keep Text Only: This removes all of the formatting, and just brings over the content in plain text format. The best way to really see how this works and what those options mean in practical, daily use is to practice. Copy and paste and try out every one of those. Also, keep in mind that those four options that I listed are not the only four options you’ll ever get when you do a Copy – Paste into a Word document. Microsoft goes into more detail on all of the options you might see, here. But what if you just don’t want to see the Paste Options box at all? It’s easy to get rid of the Paste Options box. In Word, click File – Options – Advanced and go to the “Cut, copy and paste” section. Find the box next to “Show Paste Options” and just uncheck it. If you need help with your computer on this subject or anything related, I do computer repair here in Safety Harbor, Florida and all around the country via Remote Support. Just give me a call.